Strauss-Hofmannsthal, Der Rosenkavalier. Hungarian State Opera Budapest, 2/10/10. 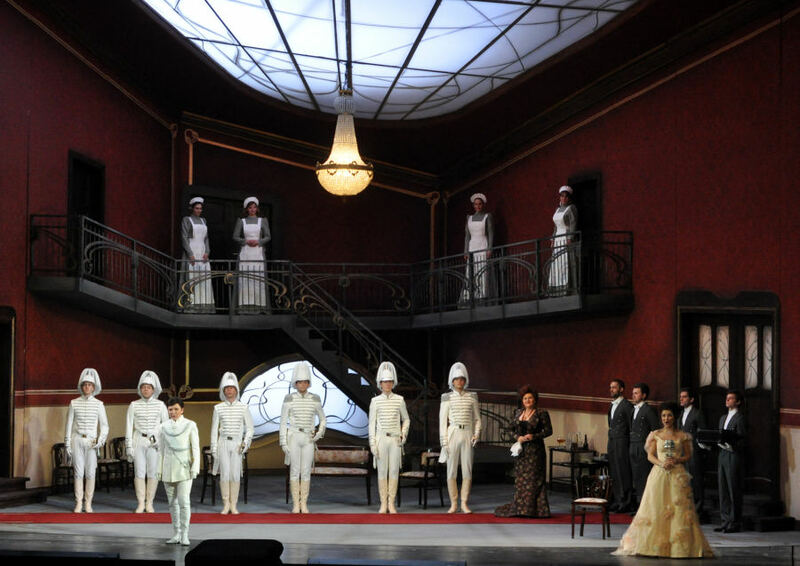 Production by Andrejs Zagyars, conducted by István Dénes with Tünde Szabóki (Marschallin), Andrea Meláth (Octavian), Géza Gábor (Ochs), Rita Rácz (Sophie), cast of thousands. 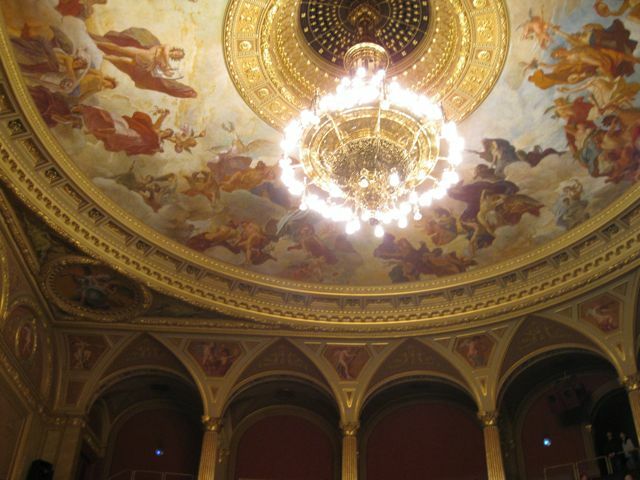 The Hungarian State Opera is not a world class company, which in a complicated work like Rosenkavalier can hurt. But this was a thoroughly rehearsed, creative, and engaging performance–in fact, dramatically speaking, more thoroughly rehearsed than much of what you see in Vienna. Despite the lack of international-level voices and the only OK orchestra, it was a fine evening out. Hofmannsthal’s text is full of details specific to the original setting of Vienna around 1735. Andrejs Zagar’s production is set around 1912. While I’m not sure when it premiered, this is not the first time this has been done–Robert Carsen used this setting in his surprisingly wonderful Salzburg production, and before him Ruth Berghaus in Frankfurt (not on DVD). (I believe Herbert Wernicke also did something similar in his much-traveled production too but I haven’t actually seen that one.) The Budapest production isn’t as ambitious as Carsen’s, and is considerably less visually opulent, but it shows again that the pre-WW I setting really works for this piece. His concept more or less stops at the period sets and costumes and just tells the story in a straightforward way. 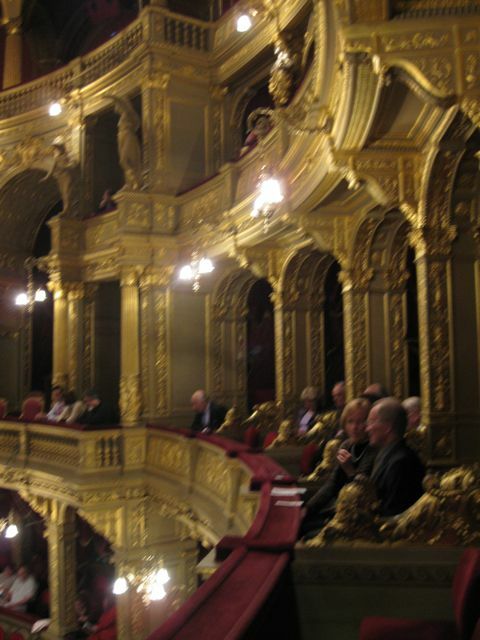 All three acts take place in a Jungendstil room whose red and gold walls conveniently match the opera house’s surrounding curtains. The color choice may have been merely an aesthetic decision but I like the idea of tying the birth-of-modernism onstage to the Baroque opera house, establishing historical continuity with the remnants of the empire that appear onstage, in Octavian’s uniform and the Marschallin’s levée. The production mixes the modern with the dated signs of the empire, remnants from 1735–the Marschallin’s elaborately uniformed servants are neatly contrasted with Ochs’s thuggish, modern-dress entourage. So, nicely done. On the musical side, the orchestra sounded busy but rarely came together effectively for the big moments, nor was its sound particularly impressive. István Dénes conducted a bouncy but undistinguished account of the score, lacking in rhythmic flexibility. Details were similarly lacking in the singing, and attention to the text was spotty. However, the voices were basically good and most of the singers were excellent actors. Tünde Szabóki was a grounded Marschallin with a lyrical voice and excellent control. She was not the most glamorous Marie-Therese but a very honest and human one. 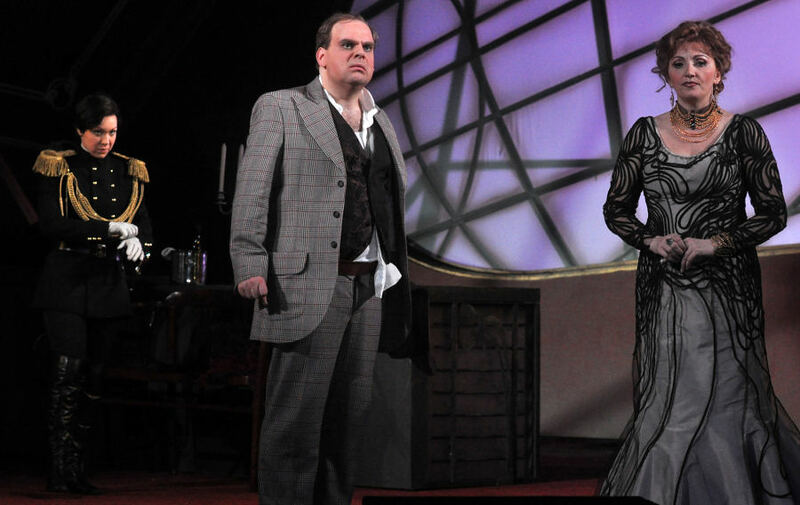 Her Octavian, Andrea Meláth, has a large voice that sometimes turned harsh, but is an interesting actor even through the excess schtick of Act 1. Géza Gábor was a young, slim, and very active Ochs, but has a real Ochs voice with excellent low notes. However for all I could tell he might have been singing in Hungarian. Rita Rácz’s Sophie looked like she’d been around the block a couple of times (we’re talking experience, not age), but after warming up her small voice she sang some lovely soft high notes. There was no stinting on offstage music or the children’s chorus or anything, but house’s weaknesses showed with the smaller roles such as orphans (who looked like they had resorted to more desperate means than begging) and various servants. Attila Fekete was a bright spot as the very loud Italian tenor, brittle but impressively secure. Tickets in Budapest are cheap by Western European standards (though many of the seats are better equipped for watching the people on the other side of the theater than those onstage) and if you’re in town this is a house that simply must be seen as architecture. It’s a great city to visit, the food is great, and it’s much more tourist-friendly than it was when I was last there five years ago (I’m not sure if this is a good thing). And judging from this performance you’re not going to imagine you’re in Vienna or Paris, but you’re going to see something quality. And, possibly, have a nice Habsburg history moment. Next: Dantons Tod at the Neue Oper Wien is coming up, and possibly La Gruberova’s concert Lucrezia Borgia this week depending on the stehplatz line situation. Production photos are by Vera Éder and show a different cast. Opera house photos are by me.